I recently found out that Quicksilver allows you to create arbitrary global keyboard shortcuts for your favorite actions. I made some shortcuts to focus / open my favorite apps: Textmate, Firefox, and the Terminal. It has been much faster than command-tabbing between these apps. I made a short screencast showing how I set up a global keyboard showrtcut to open the Pownce air app. First, open up Quicksilver by hitting ctrl space. 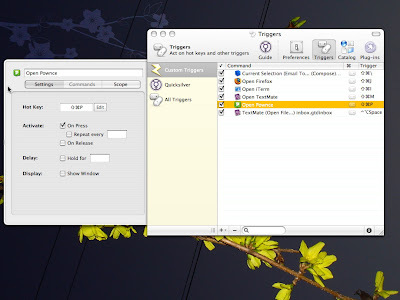 Then hit ⌘ , to open up the Quicksilver Preferences and navigate to triggers. Click the plus button at the bottom of the window and choose Hotkey. In the dialogue box that opens, begin typing a Quicksilver command like you normally would (e.g. the name of an application). After you enter the command, hit Save. Now double click your new action, and in the left drawer that opens in the edit window, enter a keyboard command, like ⌘ shift p. Close the Quicksilver prefs and you have a keyboard shortcut that works anywhere.